Have you received a traffic ticket and need to take a Texas defensive driving course to keep your driving record clean? Would you like to save 10% on your auto insurance premiums? 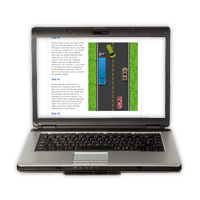 Let me introduce you to Driver Training Associates' online Texas defensive driving course. Our online course is state approved by the Texas Education Agency, making it accepted by all courts in Texas for traffic tickets. Our company has been a leader in the traffic safety industry since 1977, so put your mind at ease knowing that you are signing up with a local well respected industry leader offering a state approved course, in the most simple and easy format possible. What are some of the benefits? Well, first and foremost we offer the course at the lowest price allowed by law. There is no reason to look elsewhere for a better price. You can also access the course 24 hours a day by 7 days a week from any computer with an Internet connection. The course offers unmatched flexibility to login and out as needed, so you can move through the course 10 minutes at a time or complete it all in one sitting. Do you still want to go sit in a class or listen to a supposed comedian crack lame jokes for 6 straight hours? The choice is yours! Our State of Texas approved driving safety course is designed to keep you focused on the material through the use of videos, animations, and writing that won't put you to sleep. Most students prefer this format to an all-text course or a classroom lecture and we're sure you will too! DTA's Texas online driver safety course presents a straightforward approach to defensive driving without the useless repetition of statistics. We teach you how to drive more defensively by recognizing and changing risky driving behaviors, using concrete examples anyone can relate to. We do this by introducing you to the three Attitude States that every driver has � Parent, Adult, and Child. Through videos and examples of various types of common traffic crashes, we explain how you can control your Parent and Child Attitude States while driving. By remaining in your Adult, you can learn to avoid just about any type of traffic hazard. Don't waste valuable time and money on a boring Texas defensive driving course that will have you checking your watch every five minutes. Our course will actually teach you something useful and helpful and make you a safer driver on the roadways. Sign up today you will be glad you did. Read customer testimonials about our defensive driving course.